I don’t have any concrete at my home to test it on, but it worked pretty well on drywall. Not amazing, but pretty good. If you’re only after a stud finder, I recommend buying a stud finder. That’s a lot faster. 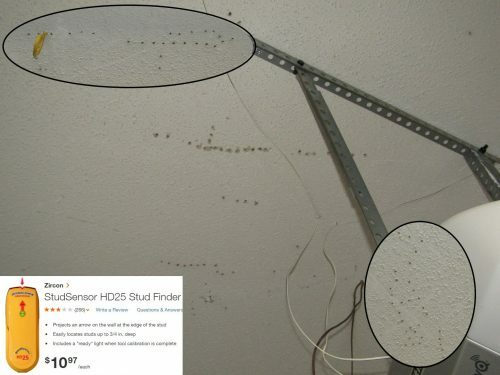 Or you could just do what these people did and drill a million holes in your ceiling. Haha, just kidding, don’t do that. Thanks, Reuben! I guess the price dropped because it wasn’t worth $100.00. Let’s see if they make one for iPhone.